Mike Bovino, director of public relations for the United States Basketball League, announces that Birmingham is one of 11 cities being considered for one of the four expansion franchises planned for the 1987 season. Bovino said that all 11 cities have been contacted about the possibility of becoming one of the expansion teams. Birmingham's mayor, Richard Arrington, was sent a letter two weeks ago. "We haven't heard from mayor Arrington. But, we take that as an encouraging sign. It makes us think he is taking his time and not rushing into things." Arrington said he has not yet acted on the letter but that he would. The USBL, which plays a 30 game season during the summer, will be entering its third year of operation. New franchises will cost around $250,000 each, and will bring the league's membership to 11 franchises. Manute Bol of the National Basketball Association's Washington Bullets and Spud Webb of the NBA's Atlanta Hawks are two NBA players who have played in the USBL. "These names will certainly get your attention. Those names speak of quality, the kind I would be pleased with," Arrington said. According to Bovino, the USBL particularly liked Birmingham. "You have three fine buildings in the Civic Center, the Fair Park Arena, and Boutwell Auditorium. Of course, the (16,000-seat) Civic Center is a little too big for our needs," Bovino said. The team would need to average only 1,500 fans, at an average ticket price of $5, to break even. The United States Basketball League set history in Miami when two female players faced off against each other as professional basketball players. Nancy Lieberman had already played a few minutes in a couple of games with the Long Island Knights this season. 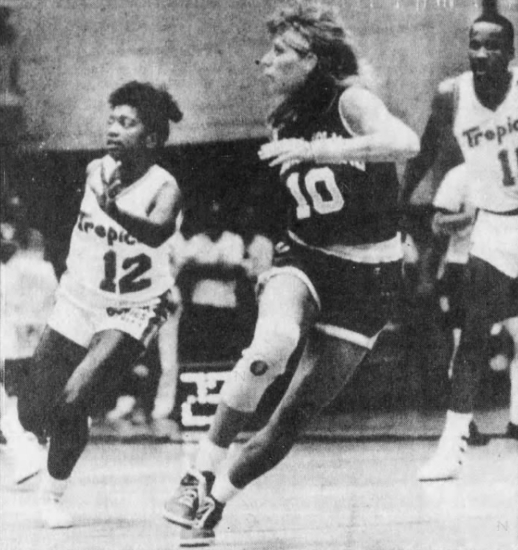 The Miami Tropics thought it would be a good attendance draw for them to feature a female player also and they signed Lynette Richardson, who made her professional debut in this game. Lieberman, 28, is a former All-American from Old Dominion University. Lieberman made national headlines last year when she became the first female to play in a men's professional basketball league with the USBL's Springfield Fame, which folded after last season. "We're good for the game. We're helping sell the USBL." Richardson, 22, is a four-time All-American just out of Florida International University. "I guess today was my payoff day. I felt pretty good. It was great to be out there." Richardson was activated for the Tropics game prior to this one but she did not play. In what was an obvious PR move, the 1,650 fans saw neither player in the game for very long nor that they made much of an impact in the game. Richardson played 10 minutes, scored three points, had an assist, and one steal. Lieberman played 12 minutes, scored two points, had an assist, and one rebound. Both women entered the game early in the first quarter and also played briefly in the fourth quarter. The game itself lived up to the hype as the Tropics and the Knights battled into overtime to decide the outcome. The final score had the Miami Tropics beating the Long Island Knights 140-138. Lieberman and Richardson will have one more chance to compete against each other when the Tropics and Knights play again tonight in Long Island. The United States Basketball League went on to play a third season. Unfortunately, Birmingham was not one of the teams. This is Birmingham's second brush with the United States Basketball League.